Today's Amazon deal is all five seasons of the award-winning Showtime series currently on Blu-ray! 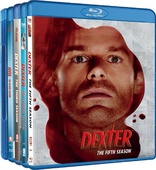 The online retailer is selling the box set of 'Dexter: The Complete First Season,' 'Dexter: The Complete Second Season,' 'Dexter: The Complete Third Season,' 'Dexter: The Complete Fourth Season,' and 'Dexter: The Complete Fifth Season' starring Golden Globe winner Michael C. Hall for just $124.99 (57% off suggested list price). Click here to own one of the best (and bloodiest) shows on TV! This offer is available until midnight PST.